The Station at their grand opening last summer. Photo by Wendi. The Beacon Pub may be gone, but there is a new source for adult beverages on the Hill. The Station coffeehouse has recently moved beyond typical coffeehouse fare, and tonight from 7 to 11 p.m. is the opening night celebration of their new wine and beer bar. Owner Luis reports that they’ll be serving wine, beer, mimosas, sangria, desserts, and light fare. 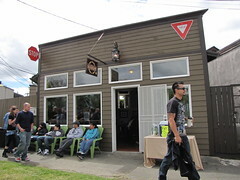 The Station is located at 2533 16th Ave. S., across from El Centro de la Raza and just north of Beacon Hill Station.